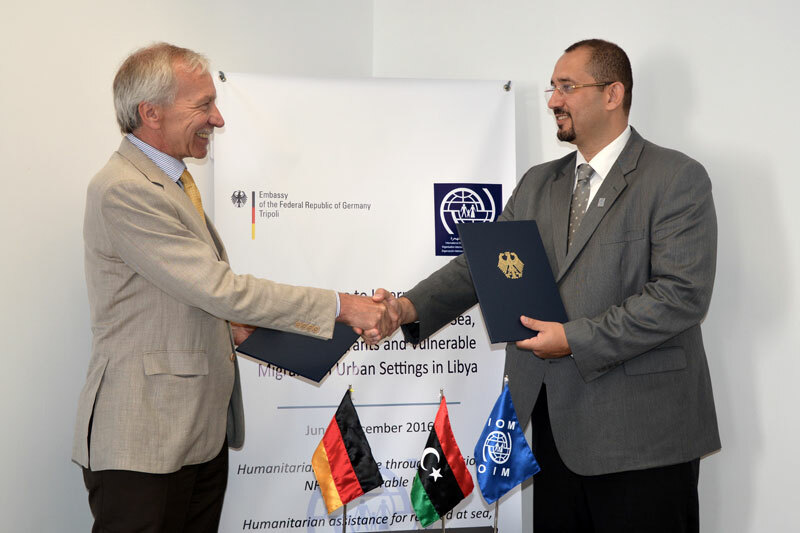 Libya - Germany and IOM Libya have signed an agreement for a six-month project aimed at providing direct assistance to internally displaced persons (IDPs), migrants rescued at sea, detained migrants and other vulnerable migrants in the North African country. The EUR 1 million project – which runs through 31 December 2016 – will include humanitarian assistance through the provision of Non Food Items (NFIs) to vulnerable IDPs and humanitarian assistance for those rescued at sea, as well as migrants detained in Libya and those vulnerable migrants in urban settings. The agreement comes at a time of increasing maritime incidents. May 2016 saw a spike in the number of maritime incidents off the Libyan coast, making it the deadliest month to date this year, with 1,086 migrants reported as dead or missing. Between 22 and 28 May alone, over 3,600 migrants were rescued at sea and brought back to Libya. IOM Libya Chief of Mission Othman Belbeisi acknowledged the timely support. “We thank Germany for their generous contributions; the need for direct support to IDPs and migrants is dire, especially with the latest displacement from Sirte. This timely contribution will allow us to address the needs of the most vulnerable,” he said.